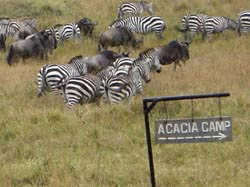 This morning I joined my first tour, the Masai Mara 3 day Safari add-on. There are a massive 25 of us on our truck. Oh, and it turned out the trip was actually run by Africa Travel Co and Go2Africa was just the agent. 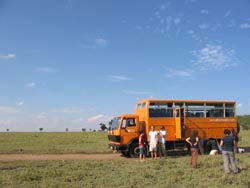 We drove and drove and drove all the way from Nairobi to the Masai Mara. With a few stops. Once at the Rift Valley view point (not as amazing as you'd expect with all the cloud cover, but it still turned out to be the best view we ended up getting after passing by at least 3 more times!). We also stopped briefly in Narok (at the petrol station, so I can't really comment on the town). We must've stopped for lunch as well, although I forget where exactly and for plenty of pee-stops (this was a trend of the trip with the large amount of cross-country driving we did! ).